The higher the concentration of tumor cells in the bloodstream, the greater the risk of metastasis. The number of circulating tumor cells indicates how well a patient is responding to therapy. Fraunhofer researchers have developed a new microhole chip that enables cells to be identified and characterized reliably within minutes. The conventional method of FACS analysis (fluorescence-activated cell sorting) provides only a rough estimate of the number of tumor cells circulating in the blood. "In FACS, the tumor cells are stained with fluorescent dyes and sorted into separate collection vessels," explains Dr. Thomas Velten, whose team at the Fraunhofer Institute for Biomedical Engineering IBMT developed the new microhole chip. The problem with marker dyes is that the number of colors is limited. "Eventually you run out of colors that are sufficiently contrasting to be able to tell them apart. Moreover, there are no suitable markers available for certain types of tumor cell, which are therefore not detectable by FACS analysis." Another drawback of FACS analysis: Test results cannot be narrowed down to a single cell because the collection vessel contains thousands of cells. 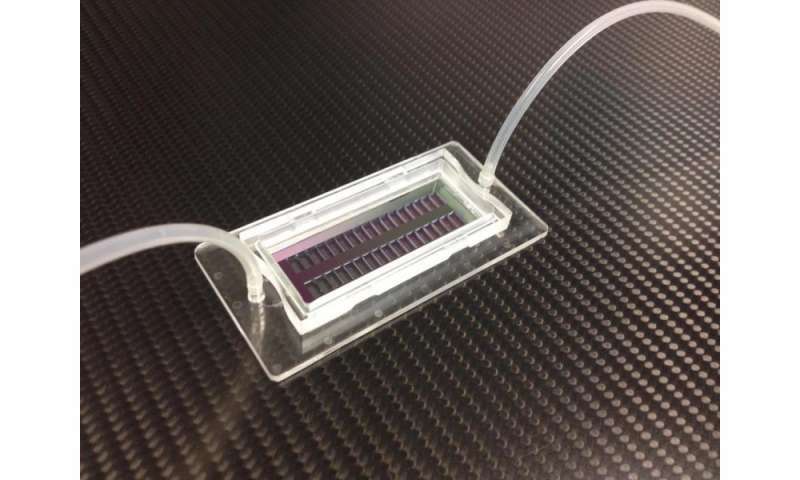 "Our new microhole chip allows single cells to be picked out of the blood sample, placed on separate holes in the substrate for analysis, and removed individually afterwards. It's easy to select cells because each one has its own specific position in the array, where they are lined up like ducks in a row. Each cell is placed on a hole but cannot slip through it. A slight underpressure is applied to the cells that holds each one in its allotted place by suction," says Velten. In a recently completed collaborative research project concerning the identification of circulating tumor cells, a two-step cell analysis method was applied. In the first step, suspicious-looking cells were selected using a microscope. In the second step, the selected cells underwent detailed analysis using the more time-intensive method of Raman spectroscopy. This involves exposing the cells to light in a defined frequency range. Tumor cells scatter light in a specific way that allows them to be clearly identified. Raman spectroscopy cannot be used on conventional arrays with a glass or polymer substrate, because these materials interfere with the measurement – but this is no problem for the new IBMT chip and its silicon-nitride substrate. Another advantage of the new microhole chip is that it can be populated with 200,000 cells, each one in a separate hole, in a matter of minutes. "This is important because the bloodstream contains only a small quantity of circulating tumor cells, which cannot be detected unless the blood sample is large enough. Older lab-on-chip technologies cannot accommodate more than 1000 cells, which is too few for this kind of application," explains Velten. A micropipette is used to remove individual tumor cells from the chip for further analysis. The level of underpressure chosen to hold them in place is too low to cause any damage. Molecular-biology analysis is a useful means of identifying the factors that determine why a specific drug is able to kill tumor cells or has no effect. The new microhole chip has many other possible applications: as a selection system for protein-producing cells, for instance, such as those required to make insulin and other biopharmaceuticals. And microchips with well-defined micropores can be used as a substrate for in-vitro modeling of physiological barriers such as the blood-brain barrier or the intestinal barrier. Barrier models play an extremely useful role in the development of drugs. The next step is to find partners willing to adapt the new technology platform to different types of application.